Q: Great start to the event for you Dani, what was the plan out there on the shakdown? DS: .Shakdown was nice, I am really happy with the balance of the car and everything we tried with soft tires and hard at the end to keep the tyres as new because we will need them in the rally. The balance of the car was ok so this is the most important, but when you are happy with the car is good. Q: What’s the hope for you here? DS: The plan is to do the best as possible as always. It is a really tough rally, a narrow one, some places are really fast some are slow, with stones on the side it is very easy to make a small mistake. Normally when it’s hot it’s really difficult to stay in the car and to concentrate. At the moment the weather is good, it will be a little difficult for the choice of the tires, specially for the first passage on the stages. Q: It’s a unique challenge in the calendar, isn’t it? DS: It’s a special rally for that, normally it is very slippery in the first pass and in the second you have a lot of building in the lines. Also narrow everywhere, so it is going to be difficult. Q: What more can you give us, Thierry, to catch Ogier? TN: I am giving everything. We are in a good fight for the championship this year. Even if Seb has now 22 points, I think the season is still long, we are not yet half, so I think there are still many opportunities to catch a lot of points. I will keep the pressure eye on Seb, but we know it is difficult he makes a crack under pressure. Q: The maximum points is going to be your target? How hard is going that to be for you? TN: You know, we are about twelve to fourteen WRC cars, some guys are running very far on the roads, so with the cleaning conditions they are going to be very fast, so my main goal can only be to finish ahead of Sebastien or to get some more points than him during the event and that is what I am looking for. He is opening the road, so I should have more better conditions than him hopefully and try to make a gap and make a difference. If I can finish the event ahead of him and be somewhere around the podium it would be very nice. Q: Is this an event you are enjoying? TN: I love Sardinia. 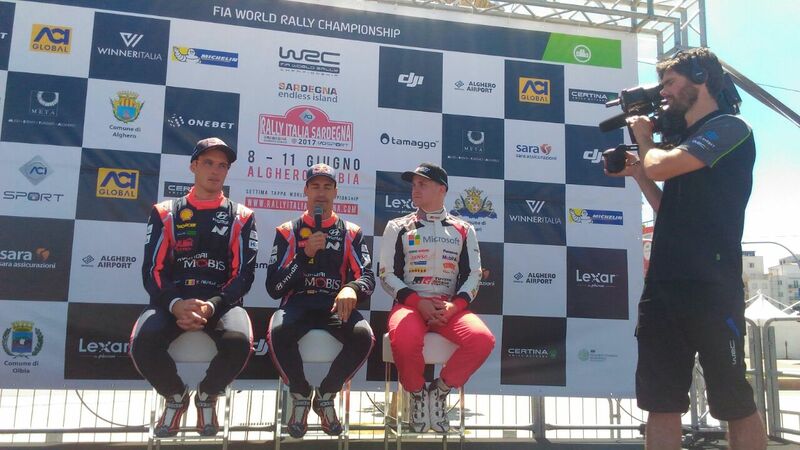 It is a really nice stage, I have been a couple of times on the podium, we won last year, so all is good for another good reason. Q: Esapekka, after Portugal, what can you do here? EL: To be honest, it’s a good question. For sure the starting position is really good tomorrow. I don’t know how I can use it, it should be an advantage, we will see, I guess I will not be on the top, I think this is slightly a more survival rally”. Q: How was shakedown this morning? EL: It was good, especially the first two rounds I was felling really good. We changed the dumpers, we tried different ones, we continued with the same tyres and maybe it wasn’t the best choice, but I am learning all the time”. EL: Yes I am, for the Finns is easy because we have sauna!